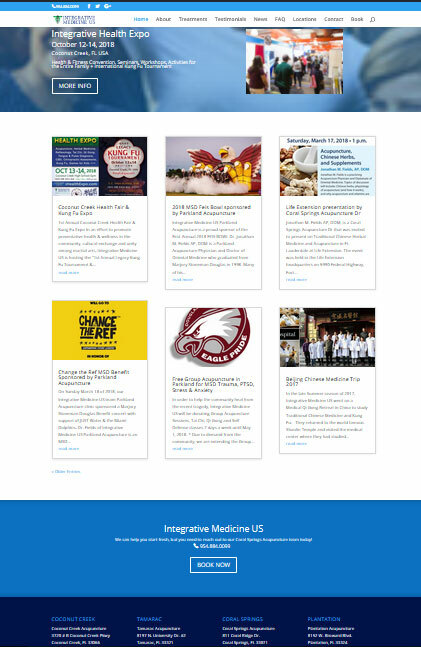 Our award winning search engine and social media marketing design team recently completed this major project for a local Acupuncture in Coral Springs clinic, Integrative Medicine US. 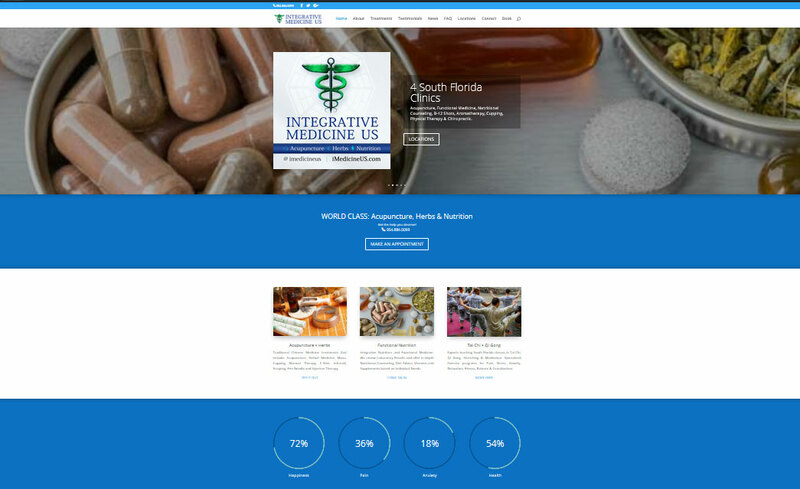 The team was involved from conception and worked on the initial branding, logo design, business cards, gift cards, website proofs, social media account setups, directories for local business and google maps, online advertising campaigns, postcards and all aspects of marketing and advertising for this full fledged Coral Springs Integrative Medicine practice. Below you will be able to see some samples of our work and screen shots of the incredible 3.0 web site we designed for the company. For more information and a live demo of the site in action. 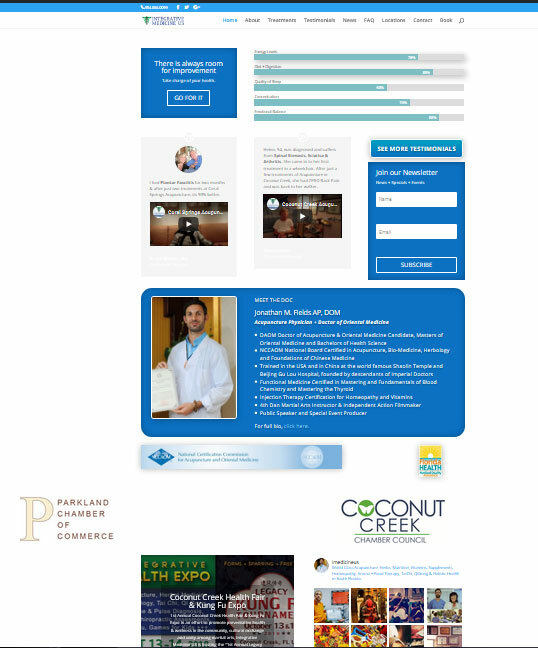 Just click on any of the links or the screenshots below and scroll through the site to see what we did for this Coral Springs Acupuncture company. It’s really amazing to see how this small acupuncture clinic started as a tiny operation with no online presence and limited exposure and grew into this huge multi-media powerhouse thanks to the help of our team. It’s gratifying to see the project come to completion and also satisfying to work with members who are helping the community. 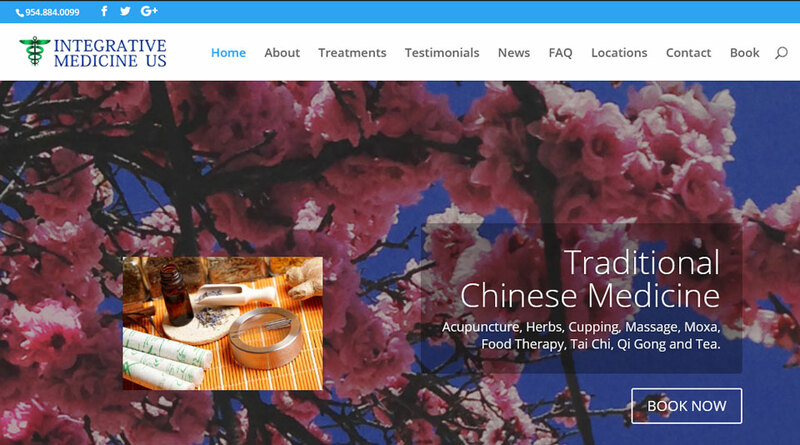 In addition, to the Acupuncture Coral Springs clinic location, we also built website for the Tamarac Acupuncture, Coconut Creek Acupuncture and Parkland Acupuncture practices. If you’d like for us to get started today on your business website development and branding needs, just hit the contact page for our information and reach out to us for a quote. We will be happy to work with you to bring the best possible results to your company. We can help you get to the next level of where you need to be to compete in a 21st century digital marketplace and advertising world.